A special breakfast adds to the fun of the first day of school, so make it a morning party with quick and easy recipes. Make veggies fun with packing and preparation tips that make healthy options a favorite part of their lunchtime. Bored with your breakfast cereal? Give your morning a new twist with these fresh takes on cereal breakfasts. 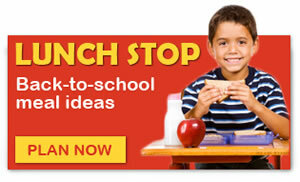 Tame picky eaters by teaching them to pack a school lunch! When kids choose their own meals, they eat more and trade less. A place where Moms get school lunch ideas, healthy breakfast recipes, healthy snack ideas & quick dinner recipes perfect for the busy back to school season.